Getting a tooth crowned kind of sounds painful, doesn’t it? Just what exactly is a crown, what does it do, and when do you need one? 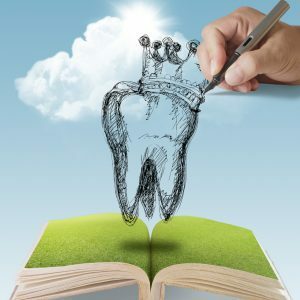 Tooth damage – If a tooth has been damaged by decay, cracked, or worn down, a crown can be added to help protect it. In some places, it can be added to cover a large filling where not much of the tooth remains, to help support it. Bridge Support – A crown can be placed on either side of a gap, if an individual is missing a tooth or teeth, with the missing tooth or teeth in the middle. Cosmetics – Crowns can be used to cover discolored or misshapen teeth. If a person has chipped front teeth from an injury, crowns can be used. They are also used to top off a dental implant. Remember, if you have any questions regarding crowns or anything regarding dental care, contact Dr. Gray’s office to speak with someone or to schedule an appointment!